With inclement weather forecast over the Trinity Alps and surrounding regions, I decided to instead head out to the southeastern Sierra for some desert peakbagging in that part of the range. I had done a few summits, Deer and Chukkar, earlier in the year and had enjoyed the area very much. 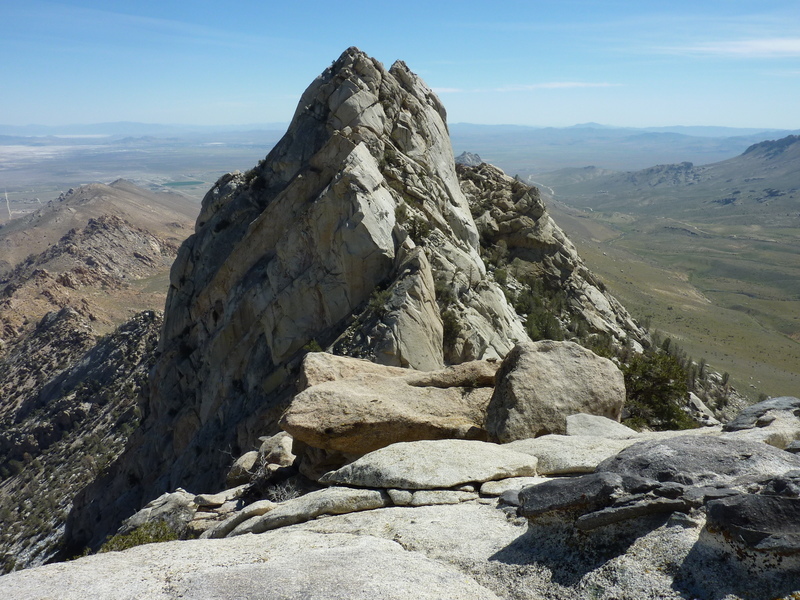 There are a whole bunch of unnamed summits on the east side of the crest that are easily accessible from SR14 and US395. Today's outing was a tour around Short Canyon, known for a large variety of desert wildflowers, popularized by the late Mary Ann Henry who first catalogued the flora in the canyon and for many years acted as docent for Sierra Club visits and educational tours. As the name suggests, Short Canyon is a stubbier version of the typical Eastern Sierra canyon, squeezed between the longer Indian Wells Canyon to the south and Grapevine Canyon to the north. Along with the HPS-listed Five Fingers, there are five unnamed summits surrounding the canyon. The highest of these, Peak 6,420ft, rises at the western head of the canyon about 2mi ESE of Owens Peak. It would prove the hardest of the bunch as I failed to find a route that was less than class 5 reaching to the summit. Despite this, it was a highly enjoyable day with far more scrambling than I had expected to find, with fine weather and equally fine views. As a highly unexpected bonus, I found abundant wildflower displays on many of the slopes as it appears my visit coincided with peak flowering season, or very close to it. My route was not particularly creative, simply connecting the five summits in as small a loop as possible after driving about 3mi on a good dirt road to the Short Canyon TH west of US395. The Owens Peak Wilderness which encompasses all five of the peaks starts just west of the TH as noted by a sign where a trail starts up the canyon from the parking lot. My route went north, directly up sandy slopes to the summit of the first, Peak 5,015ft. Tiny flowers were found everywhere underfoot, mostly in shades of yellow and white. Though they weren't of sufficient size or quantity to project those colors from a distance, they were unmistakeable underfoot and offered some measure of compensation for the incredibly tiring effort of climbing steep hills of soft sand. Fat caterpillars were abundant as well - feeding on the desert's bounty for the short duration that it lasted. I wondered why I didn't see more birds feasting on these easy targets in turn. It took most of an hour to reach the top of Peak 5,015ft, a distance of only 2/3mi. Looking south and west afforded me views of all the peaks I was to visit today. Clouds hung low over portions of the Sierra Crest obscuring Owens Peak and other points north, threatening to overtake Peak 6,420ft nearest to Owens. A few scraps of paper were found in a small container. Dennis Burge and Bob Joy, two elderly gentlemen I had met a few years ago in Ridgecrest were among the previous visitors. Bob and pal Dave Brown had come back for a second visit only a few months ago. My route now followed the ridgeline west, a far more enjoyable endeavor after that intial uphill grind. Indian paintbrush added pockets of red and orange along the way. I came across an old fenceline. To the north are private inholdings down in Grapevine Canyon where I could see what looked like ranch buildings and a going ranch concern. I suspect the fence had to do with the ranch at one time, but it doesn't appear to be maintained any more. I spent the second hour covering the mile distance to Peak 5,038ft, only slightly higher than the first peak but with a 500-foot drop to a saddle between them. There was no register at this or the remaining peaks I visited on the day. The next nearest peak was Peak 5,660ft a mile to the southwest across the canyon which looked to have some interesting scrambling to reach its rocky summit. This would have to wait, however, as the next summit in line was Peak 6,420ft about 1.5mi to the west. The next hour and a half were a relatively easy jaunt, traversing the ridgeline further before dropping down to approach Peak 6,420ft from the southeast side. I passed through fields painted purple and yellow, the flowers now so abundant that they could easily be seen from the opposite side of the canyon. Peak 6,420ft proved to be a rather difficult piece of rock. Unlike its lower brethren, this one had a great deal more granite, large blocks of the stuff and cliffs on most sides. My first effort to approach from the SE ended just short of the summit when the final 150ft proved insurmountable when I reached a notch on that side. Hmmm, this was proving to be a toughie. I descended a good ways down a chute heading west until I was below a saddle between the peak and its lower sister to the west. Somewhere in this chute I picked up a rap sling that someone had used to descend lower. I continued down what I judged to be class 3 terrain, wondering about the sling. I climbed up to the west saddle only to find no way on either the north or south side to climb much higher. How was it that there was a class 5 summit in the Sierra I'd heard nothing about? This was really perplexing me. I spent more time exploring other options, finally spotting a second rap sling around a tree about 50ft below the saddle on the south side. This was a stouter climb, more like class 4 with a slightly sketchy lieback that got me higher onto the South Face. After scrambling through the small tree in the crack around which I'd spied the sling and climbing another 20-30ft higher, I thought I had found the crux and was on my way to the summit. Not so. I was stopped yet again, this time by some steep slabs on more crumbly granite that had some nasty exposure. After examining this from several angles I had to admit defeat. Back down I went. I left the first sling tied to the second so as to make it more easily identiable from below. I thought I would go back to the saddle and climb the western summit as consolation, but this proved daunting as well and I was stopped yet again. By now I had spent the last two hours scrambling around on class 3-4 terrain, finding the way blocked at each significant turn. I felt like I had pressed my soloing luck as much as I should be allowing myself to do so and was ready to find my way back to easier terrain. Down I went, resolved to pay a return visit with some climbing gear and a partner. I had a more relaxing time traversing the slopes eastward towards Peak 5,660ft, with more slopes of bright yellow flowers. A deer trail whose path was made up of the same flowers with more barren slopes on either side was another interesting sight. Did the flowers grow there because the ground had been churned, or perhaps because the nitrates and water in the deer urine helped nourish them? It was a curious thing. When I reached near to Peak 5,660ft I found myself scrambling on more class 3 terrain as I tried to get to the summit. My first effort from the south was rebuffed, but as the overall profile was not as severe as Peak 6,420ft, their were more options and eventually I found a helpful ledge system leading around to the north side from the west which provided a fun, albeit circuitous route to the summit. A bleached bone had been left at the summit in lieu of a register or cairn. It was a fine summit with fine views. The clouds over the crest had dissipated, leaving a clear view of Owens Peak in that direction. The easier route proved to be the east side of Peak 5,660ft which was far more straightforward than the western approach, and it was down this way I headed on my way to the last summit, Peak 5,220ft. Lupines made an appearance on these eastern slopes adding purple to the profusion of yellow that dominated the scene. The last peak proved almost trivial after the last two efforts but I made no complaints. By now it was 3:30p and I'd had a full day's worth and was happy for the easy one. I had originally thought I might continue east to tag Five Fingers a second time but by now I was ready to call it a day. I dropped off the northeast side of Peak 5,220ft, into Short Canyon where I had some fun finding my way down to, and across the brush-lined creek I found at the bottom with just a trickle of water. On the north side of this creek I picked up the Short Canyon Trail which I had spied from above and followed this back to the TH where I arrived at 4:15p. How can you call Pearsonville a "standard desert community?" They bill themselves as the Hubcap Capital of the World! Visit the Subway in Eddie's World C-Store Gas Station in Beatty Nevada for more memorable cultural regression . . .